I don’t know about you but in my household the the Christmas feast seems to live on for days and days! We ALWAYS over cater so I spend what seems like forever using up the numerous and varying leftovers we have in all ways possible. I have previously posted about ways in which to use up leftover chicken or turkey in curries, risotto and pies however this year I was keen to try out some new recipes and use up side dishes such as veg and gravy. The first thing I did post the Christmas mayhem was to make a delicious stock from the turkey carcass. It really is a great idea to do this as otherwise the bones only get chucked in the bin and by boiling the carcass down for several hours with a few herbs, peppercorns and veg remnants you get the most falvoursome, delicious stock which really adds something special to future soups, sauces and risotto. Plus, making stock requires very little prep and effort so you could do it whilst taking a Boxing Day nap on the sofa! Next of the list was to make bubble and squeak out of all the leftover vegetables we had piled up in the fridge. We mashed together roast potatoes, parsnips and carrots with carrot puree and Brussel sprouts with pancetta into patties before dusting with a little flour and pan frying in batches with a little leftover turkey flat. 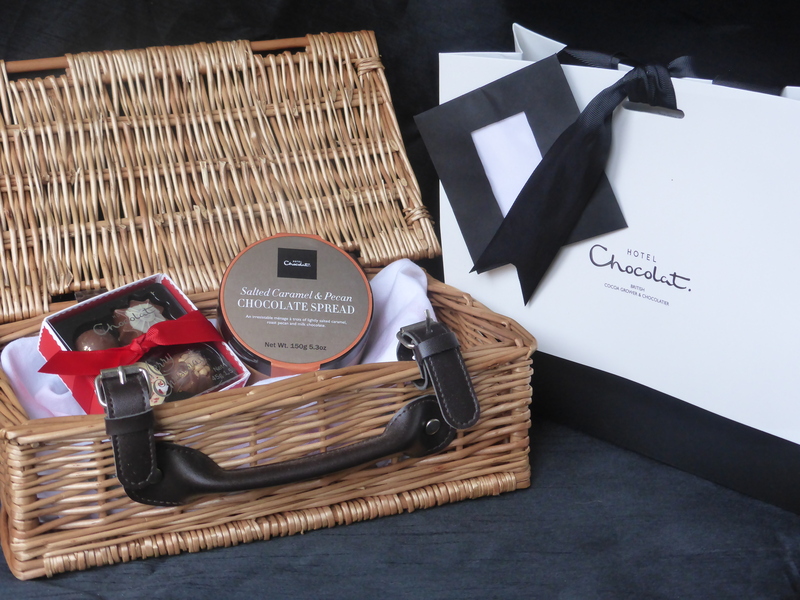 Completely indulgent but at least you can make sure you are at least having some veg during the Boxing Day chocolate binge! To counteract the indulgence, I also made some roasted carrot, parsnip and garlic soup to pop in the freezer all ready for the New Year health kick! Early on in Christmas week I was scanning for last-minute inspiration when I came across Jamie Oliver’s annual installment on Channel 4, Jamie’s Ultimate Christmas (aired 8pm, Channel 4, Monday 19th December 2016). 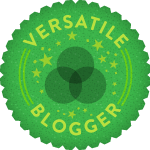 I am a massive Jamie Oliver fan, as readers of this blog will be well aware, so I couldn’t resist tuning in. 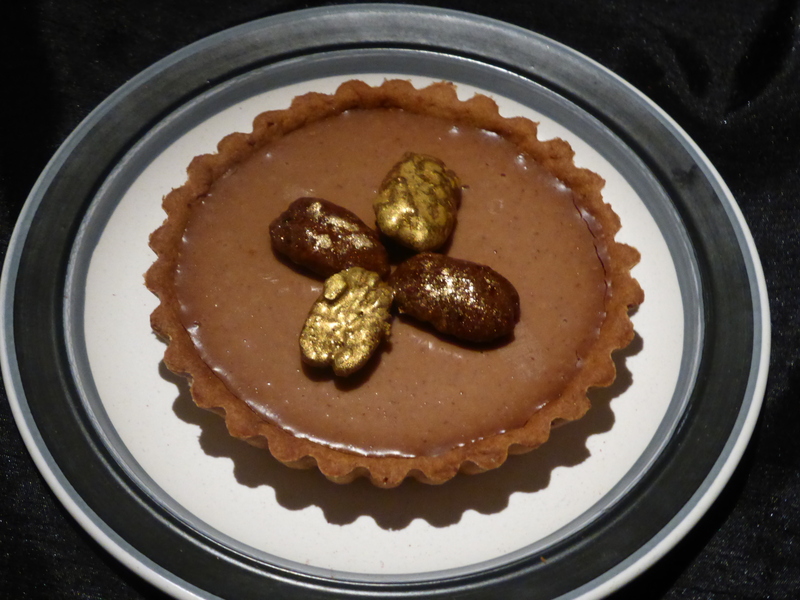 Jamie shared some wonderful recipes and tips for side dishes such as gravy and roast potatoes, main courses including a mouth-watering beef Wellington and desserts including a very indulgent chocolate pud which looked absolutely heavenly! Well worth a watch on demand if you are after some inspiration for future meals or better yet, Jamie Oliver’s Christmas cookbook, Jamie Oliver’s Christmas, is now available to purchase. One of the dishes which really caught my eye was Jamie’s leftover turkey risotto which not only used up the remaining turkey but also turkey skin, gravy, cheese, stock, veg and prosecco (whatever leftover prosecco is!). A winner for sure! 1) Place any leftover skin from the carcass in a cold frying pan. Heat gently until the fat disperses and the skin becomes super crispy and golden. Sprinkle over some thyme then remove from the pan and set aside to keep warm. 2) Place premade turkey stock in a pan on the hob and allow to simmer gently. 3) Heat a frying pan with a little fat then cook the veg gently until translucent and soft. Stir in the risotto rice and heat until you hear soft popping then, pour in a decent glug of prosecco and allow it to bubble away. 4) Add a ladleful of stock at a time to the frying pan, allow it to cook away before adding another ladle, remembering to stir frequently. 5) After roughly 15 – 20 minutes, the rice should be almost cooked. At this point, begin reheating your leftover gravy. 6) Remove the risotto from the heat and quickly stir in the parmesan, butter and marscapone. Season and scatter a little more thyme. 7) To serve, ladle the risotto into bowls leaving a small divet in the middle in order to spoon in some of the delicious gravy. Sprinkle over a little more parmesan and top with the crispy turkey skin. We deviated from the recipe a little due to what we had in the fridge. For example we shamefully had run out of leeks and celery so we omitted these from the recipe but increased the amount of onion. We also didn’t have any marscapone to hand but had a bit of cream cheese lying around from the salmon pate parcels we made for the starter on Christmas day (recipe to follow in due course!). The substitutions certainly didn’t do the dish any harm as it was, quite simply, delicious!! The risotto was so creamy, rich and flavoursome, helped by the homemade turkey stock that we allowed to boil for some 8 hours a few days before. We also used a bit of leftover turkey fat that we had on hand to start the risotto off which certainly led to the depth of flavour. I was hesitant about the addition of the gravy but it really was a nice deviation from a traditional risotto. I used another Jamie Oliver recipe for my Christmas Day gravy – Get Ahead Gravy, which really was rather wonderful and took some of the stress out of the last-minute cooking on Christmas day, highly recommended! Obviously this dish is rather indulgent due to the butter, fat, cheese and crispy skin but it is so tasty and a wonderful way to use up Christmas leftovers and one last treat before the post Christmas diet begins! Of course the turkey could be substituted with chicken so this dish could be made after a normal Sunday roast too! Definitely one I will be trying again, gravy and all! Hello there! I recognise that it has been a shamefully long time since I last posted (almost two years in fact!) but I have decided to get back to writing and yet again bore everyone senseless with my love of cooking and good food! Neil almost proposed to our electrician but luckily ended up asking me instead! Last but not least, I married my best friend in front of our family and loved ones. We really had the most perfect day ever! All in all, it has been a rather busy few years which is part of the reason I have neglected my writing! In order to come back with a bang I thought it was about time I shared with you some of the wonderful meals we had on our mini moon at the glorious Pig Near Bath. I had wanted to visit one of ‘The Pig’ hotels for years so as soon as we set the date for our wedding, I knew ‘The Pig Near Bath’ would be the perfect spot for a relaxing break after the big day. The hotel is a gorgeous country house, sympathetically modernised, in the beautiful Somerset countryside near to both Bath and Bristol. Although the rooms and hotel are comfy, luxurious and beautiful, the real reason I was so keen to visit was the food and, most importantly, the small chain’s ethos. Everything possible is locally sourced, even down to the snacks on offer in the larders in each bedroom to the toiletries (which are made by Bramley by the way and smell divine!) in the bathroom. Something like 80% of the food served in the restaurant is from the hotel’s extensive kitchen gardens and greenhouses, the remaining 20% comes from within a 25 mile radius which is no mean feat! Due to this, the restaurant menu can change several times a day according to whats in season, what’s available and what is at its best! As it was our ‘mini-moon’ we decided to treat ourselves and opt for a ‘Big Comfy Luxe’ room and we were certainly glad we did….our car was packed full with bits and pieces from the big day so we needed the space! The room was large and spacious, wonderfully peaceful and oh so very comfortable. So much thought has been put into designing the rooms at The Pig and they really are something special! All of the little touches, such as books on kitchen gardens and vegetable growing, a digital radio playing classical music as we walked in and a complimentary bottle of champagne on ice, did not go unnoticed and made us feel very relaxed and at home. After the torrential rain abated, we took a wander around the hotel grounds to have a nosey at the kitchen garden. It was wonderful to take in the many varieties of fruit and veg. I did wonder whether the garden would be for show but you can tell how much work goes into sustaining the multitudes of hungry customers that journey from miles around to eat at The Pig. Both Neil and myself were astounded at just how extensive the kitchen garden was! For those that want to really spoil themselves, it is possible to stay in ‘The Apple Store’ or ‘The Hide’, both of which are situated in the kitchen garden. Of course we couldn’t travel all that way without having a meal in the lovely light and airy restaurant situated in the conservatory at the edge of the main house. I loved the fact that herbs and plants were used as decoration on tables and window ledges – at one point our waitress took a few cuttings of rosemary to be used in the kitchen! After asking for recommendations from our extremely knowledgeable waitress, I opted for ‘James Golding’s home smoked Wester Ross salmon, Somerset cider dressing and pickles’ to start. I adore smoked salmon and eat it at least once a week….I can honestly say this was without a doubt the best smoked salmon I have ever tasted. Neil had serious food envy after trying a mouthful! The sauce was wonderfully sweet which off set the salmon’s saltiness perfectly. Salmon and cider are clearly a match made in heaven! Neil opted for the ‘Crispy South coast monkfish, toasted fennel mayo and agretti’. I must admit neither of us had any idea what agretti was…it is an Italian vegetable, similar to samphire, that became so popular in the UK after it featured on Masterchef that Agretti out forcing chefs to grow their own stock! The delicate monkfish was perfectly crispy and worked really well with the fennel mayonnaise. Plus…..have you seen the plates?! Beautiful! Onto the mains! Now it was my turn to get food envy! Neil chose the ‘Free range chicken, swede mash, garden peas and pancetta’. We often cook swede mash in an attempt to cut down on carbs and up our veg intake…if it tasted like The Pig’s version I don’t think either of us would mind so much! The mash was so creamy and tasty, it really was something special. The chicken was lovely and moist and melted in your mouth. All in all, a simple dish but a clear winner! I went for ‘Brookfield Farm English rose veal chop, charred Belton leek, basil and hazelnut pesto’. Although I did enjoy my meal, for me it didn’t quite live up to Neil’s although it was a nice change. I thought the hazelnut pesto was unusual and a bit more bitter than normal pesto but really delicious. The veal was cooked well and the charred leeks were delicious! There was no doubt we were both going to go the whole hog (well we were at the Pig!) and have three courses each. Neil had the ‘Dark chocolate tart, Longman’s clotted cream and garden redcurrant sauce’ which was so gorgeous rich and silky whilst the redcurrant sauce offered just the right amount of tartness. I had a ‘Somerset gooseberry and elderflower fool with ginger snap biscuits’. I was really pretty full so this was a really good choice for me as the fool was light and refreshing plus, ginger biscuits are my fave! I loved the presentation too as I think it is so pretty when restaurants decorate their dishes with edible flowers, I think this dish could have looked a bit boring without a pop of colour! Although we were were both massively full, we couldn’t resist ordering some ‘Piggy Fours’ to take back to the room with us. We didn’t end up eating them until the following day but my word they were lovely….bite sized pieces of all my favourites including handmade fudge, chocolate truffles, blueberry and lemon mini muffins and last but not least coconut ice which was a real throwback to my childhood visits to North Wales! As we enjoyed the meal on the first night of our mini moon so much, we really couldn’t resist having a cozy night in the bar on the last night of our stay in front of a roaring fire, of course accompanied by more delicious food in the form of some nibbles, otherwise known as ‘Piggy Bits’! We opted for ‘smoked vodka BBQ ribs’, ‘tempura garden greens’ and ‘bacon jam on toast’ before having a few cocktails, a cheeseboard and an obligatory glass of port! For both of us the star of the show was most definately the smoked BBQ ribs……they were so tender, deliciously sweet and sticky with an extra punch of smokiness courtesy of the smoked vodka. We were so in love with the BBQ sauce we raved about it to the staff who kindly gave us the recipe….I cannot wait to recreate the dish at home myself! After a few too many delicious cocktails in the bar, it was time for a ‘cozy night in’, in other words, a complimentary DVD and popcorn from reception. It is the little touches like this, the Hunter wellies available to borrow from the lobby and the complimentary cocktail kit that welcomed us after a day sightseeing in Bath, that make The Pig so special and welcoming! Last but not least, I cannot resist saying a few words about the delicious breakfast we were treated to before our long drive home! Several reviews I have read grumble about breakfast not being included in the rather pricey room cost. Perhaps it is a little steep to pay £15 for a cooked breakfast when you are already paying for a top end hotel however, do not let that put you off! The breakfast at The Pig is really pretty wonderful, from numerous varieties of freshly baked bread to brightly coloured compotes, free range eggs from the chicken coop and even cake (cake at breakfast….what a brilliant idea!). Neil and I really made the most of the buffet before having something cooked….of course I couldn’t resist more of that perfectly smoked salmon! Our meals at The Pig really were wonderful, as were the accompanying wine and bubbles, not to mention the brilliant service! In my opinion, dining at The Pig is really reasonable, particularly considering how local and fresh the wonderful food is and the massive variety of interesting wine on offer. Staying at the hotel really is a lovely treat. Yes, it isn’t cheap but it truly is an unforgettable stay and leaves you feeling relaxed, pampered and very well fed! If you aren’t local to any of the Pig Hotels….it is well worth the trip I am already counting down the days until our first wedding anniversary when we hope to return to another Pig hotel! The next stop on our USA road trip was the beautiful Fairhope, Alabama to visit some good friends from our time living in Mississippi. I am just so sorry it has taken me way too long to recount our visit here as it really was one of the highlights of our Deep South Road trip….oh the joys of having computer issues!! Fairhope is a picture perfect Southern city situated in the South-West part of Alabama state, right on the gorgeous bay of Mobile, within a stone’s throw of the world-famous Florida Gulf Coast. Apparently, the town was established in 1894 after a group of people settled in the area hoping for “fair hope of success”, and so, the town was named! 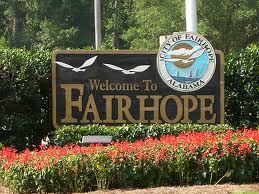 The city is pretty small and definitely retains that small town charm complete with world-famous Southern hospitality; Fairhope is a very friendly place and had a community atmosphere that we were all jealous of! We were fortunate to visit the town on the first Friday of the month which features a down town open evening, otherwise known as the ‘art walk’. During the ‘art walk’, some twenty odd local businesses and art galleries open their doors to visitors, free of charge, where customers are invited to sample delicious canapes, and a drop or two of wine, whilst perusing the beautiful art work for sale and listening to some great entertainment from Fairhope musicians. There was a fantastic atmosphere whilst walking around the down town area; it was obvious that the monthly event is well supported by Fairhope residents with a real sense of community and local pride. 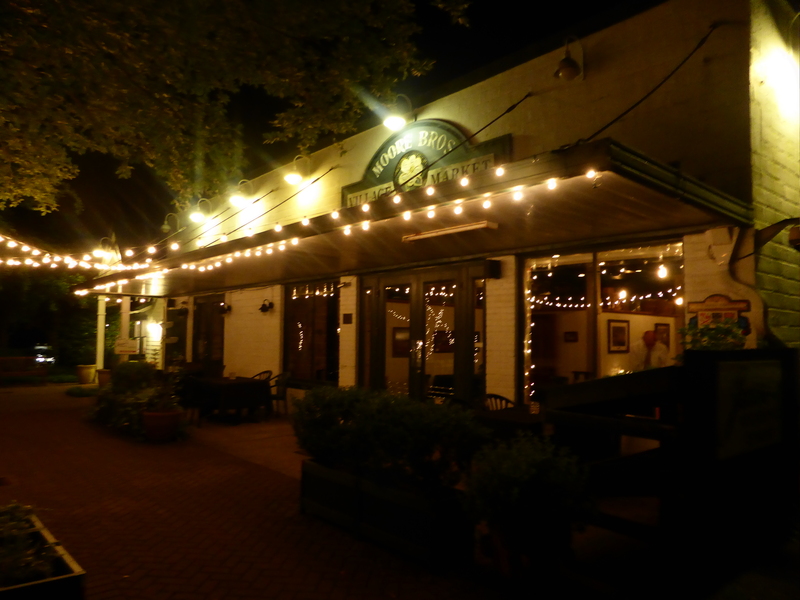 After making several purchases, it was time to jump in the car and make the drive to the beautiful Magnolia Springs to indulge in some indescribably wonderful food at Jessie’s Restaurant. From the moment I stepped into Jesse’s, I was overwhelmed by the warm atmosphere and the amount of history associated with this unique place; it is evident that Jesse’s is the heart of the Magnolia Springs community and that the locals and owners are staunch supporters of the restaurant’s heritage. Originally, the building was opened as Moore Bros Store in 1922, before being converted into a restaurant in 1999, incorporating the post office next door. Fittingly, the restaurant was named after Jesse King, the much-loved shopkeeper who worked at Moore Bros for over sixty years and never missed a day’s work. Walking around the building, it is clear that the present owners are highly respectful of the Jesse’s history as the place is filled with treasures dating back several decades hinting at the buildings past, such as the pigeon holes from the post office and the ice box which takes pride of place in the cafe. As there are some seriously delicious cocktails on offer at Jesse’s, it seemed only right that I indulged in a mint julep, a drink synonymous with the deep South and the Kentucky Derby in particular. 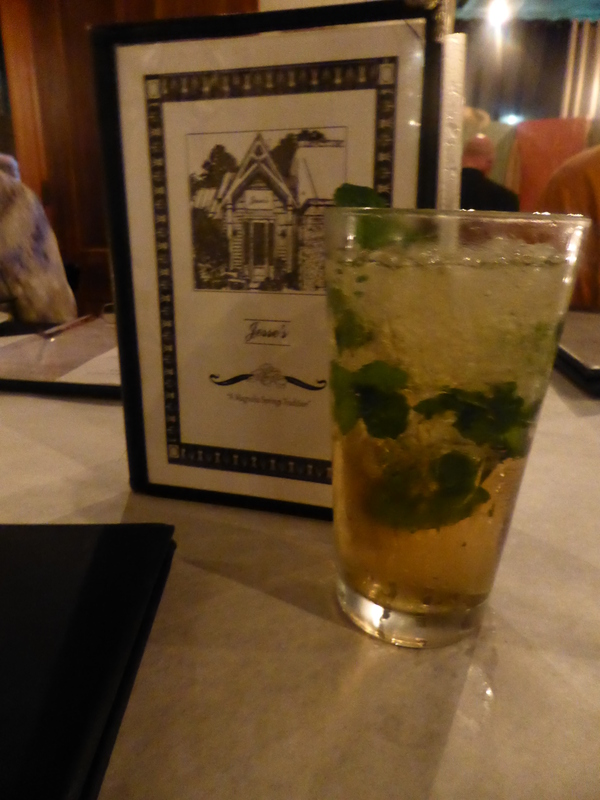 The Jesse’s version of this famous drink contains Jack Daniels, Southern Comfort, simple syrup, club soda and the all important mint. It was light and refreshing and a good start to the evening! The food at Jesse’s is wonderful….so wonderful, in fact, that I can still practically taste it even now, some seven odd months later!! 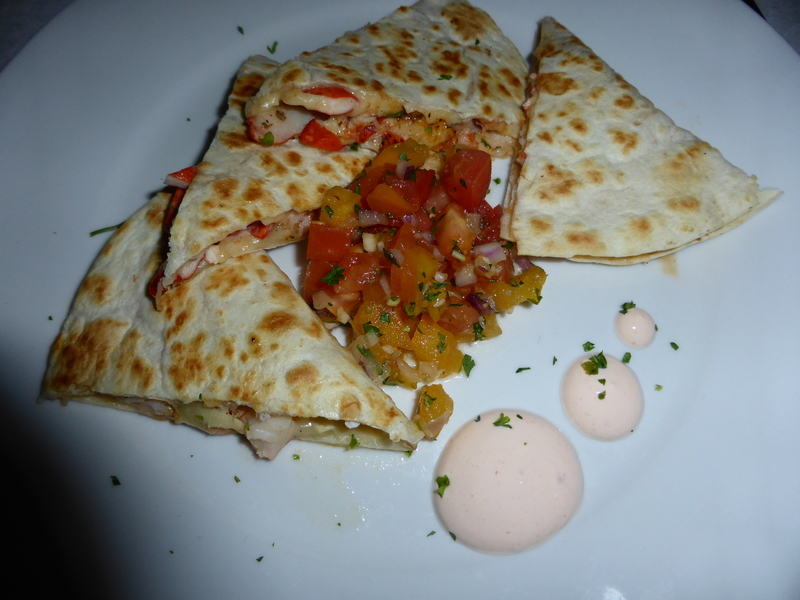 To start I opted for ‘Lobster Brie Quesadilla – yellow tomato pico and Chipotle creme fraiche’. Wow this was good! Lovely big chunks of tender lobster with a very creamy sauce which perfectly contrasted the crispy quesadilla and juicy sweet tomatoes. I loved this dish, full of flavour and something a little bit different from what we can get in the UK; the perfect fusion of seafood and Mexican cuisine. 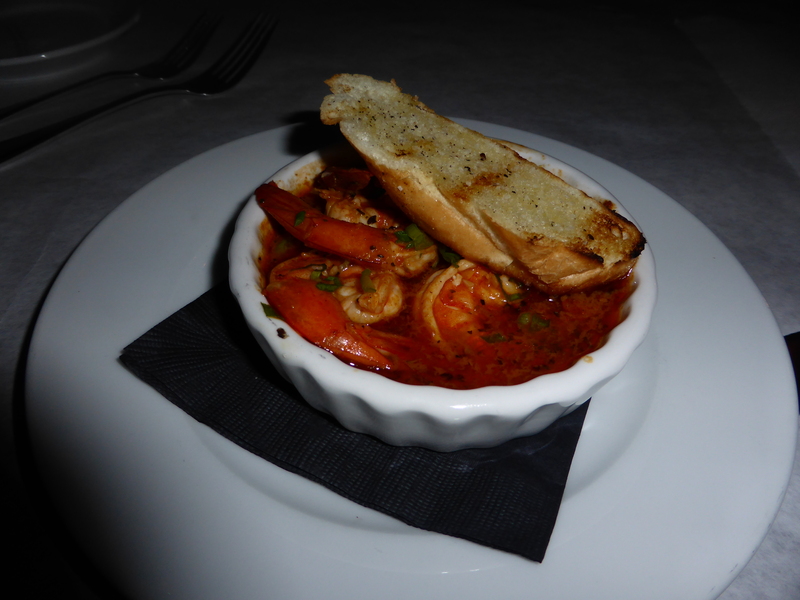 Neil chose to start with ‘New Orleans Barbeque Shrimp – garlic, butter herbs and grilled garlic bread’. The shrimp were big and juicy and complemented by the sauce which was not too overpowering. Neil loved that there was plenty of crispy bread for dunking! Next my Dad and I couldn’t resist treating ourselves to a few oysters; we love the things and rarely have them in the UK due to the price, availability and quality. All seafood at Jessie’s is fresh as fresh can be! Fish is not featured on the regular menu as dishes are created depending on what the chef is able to source on each particular day…..I love this ethos and this explains the great quality of the food at Jesse’s! At $8 for half a dozen oysters, my Dad and I were as happy as Larry! 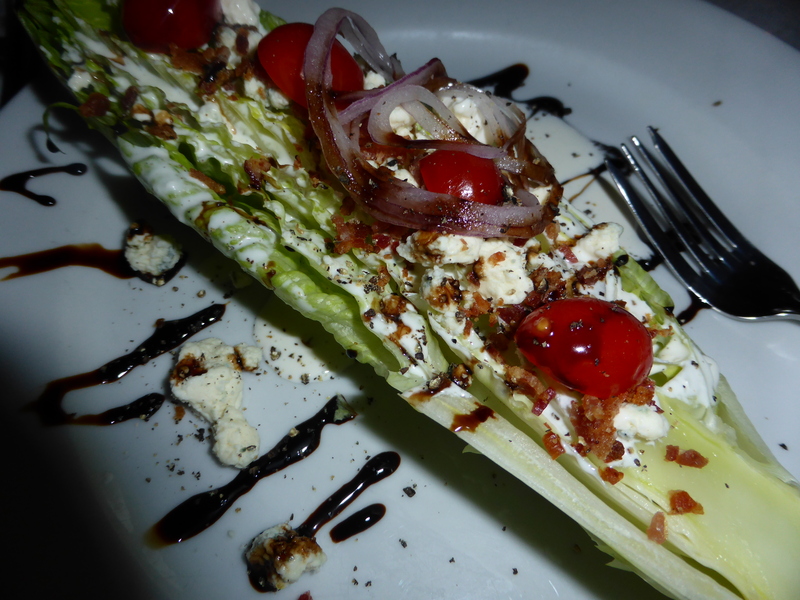 As it came highly recommended by our fellow diners, I decided to have a salad and chose the ‘Romaine wedge – bacon, bleu cheese, tomatoes, red onion, balsamic vinegar reduction, buttermilk bleu cheese dressing’. I loved the creaminess of the dressing with just the right amount of saltiness from the cheese; there was a good balance of sweet and salty flavours in this salad with a nice contrast offered from the crunch of the romaine wedge. Blue cheese lovers would not be disappointed! I found this salad to be of a much higher standard than the majority of side salads I sampled during our trip; it was much tastier and it was obvious that a lot of thought had gone into the dish rather than just tossing some leaves on a plate. 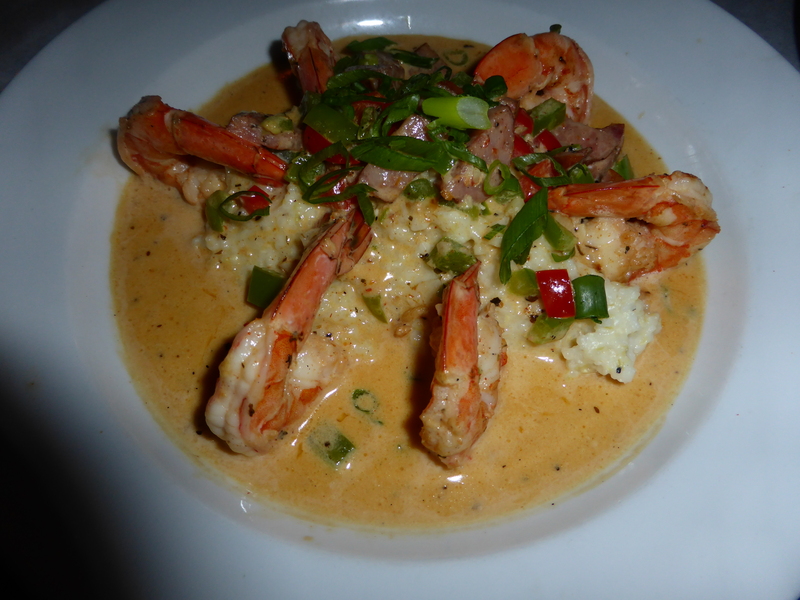 As I had been wanting to sample some grits during our trip, for my main course I chose ‘Shrimp and Grits – Gulf shrimp, Conecuh sausage, green and red peppers, green onions, smoked Gouda grits’. I bet the UK readers amongst you and wondering what on earth grits are! Grits are a dish made from ground corn, boiled with water and seasoning to create a porridge like substance. The dish is often eaten for breakfast and can be found in many fast food restaurants across the Deep South. My Father often told visitors to the South unfamiliar with grits that the finished dish looked like wallpaper paste and tasted like it too; he was obviously not a fan! 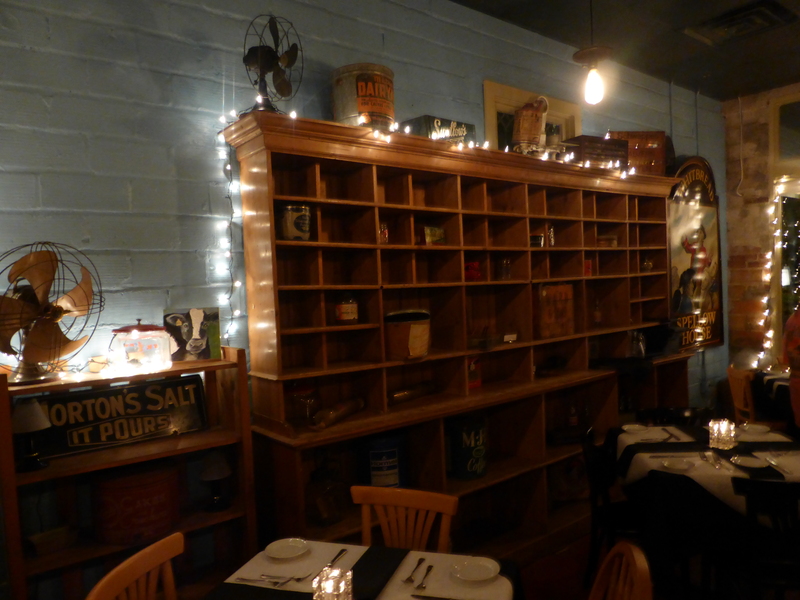 Grits, if done badly, can be tasteless mush however, when done right they are oh-so-good…..the grits at Jesse’s are even better! Creamy but with tons of flavour the dish was elegant and supremely satisfying! I loved the presentation of this dish but the flavour combinations even more so. 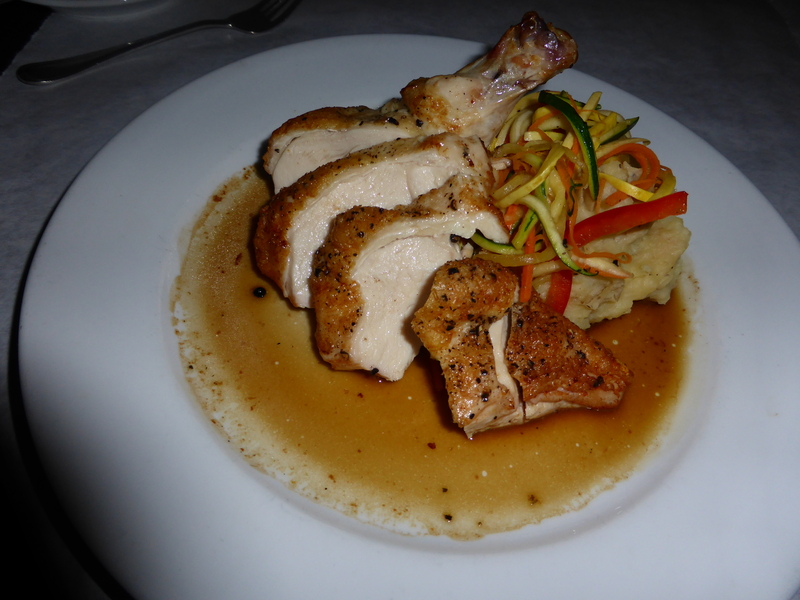 Neil chose ‘Ashley Farms Airline Breast of Chicken – Pan fried, bacon sage gravy, garlic mashed potatoes, local vegetables’. Again, the presentation of this dish and the wonderful flavours took it from typical Southern cooking to something much more special. The mashed potatoes and gravy had such beautiful deep flavours and the chicken was cooked to perfection. 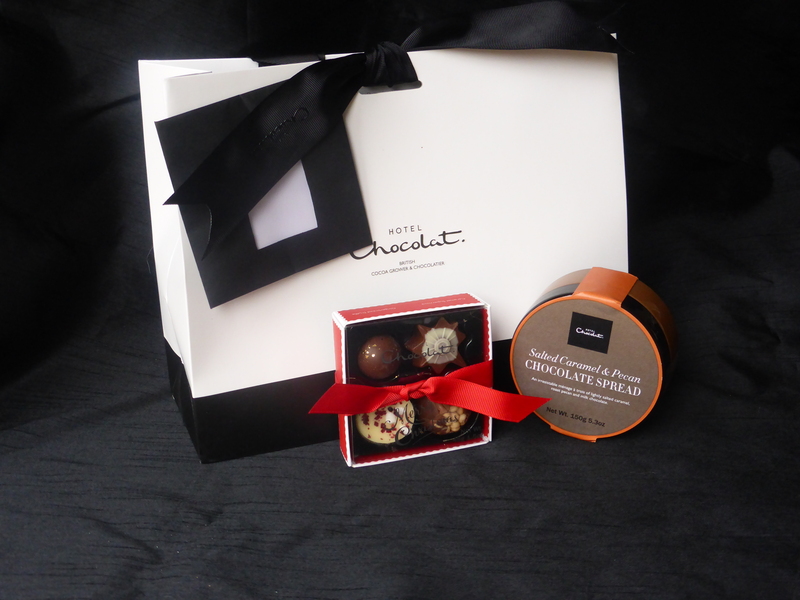 Everyone in the group was thoroughly spoilt with beautifully presented, delicious meals. My Dad, who is fortunate enough to be extremely well-travelled and has eaten in some of the better steak restaurants across the globe, opted for a steak and he proclaimed that hands down, it was the best steak he had even eaten. I was lucky enough to sample a small sliver and I must say it was the tenderest beef I have ever tasted with a beautiful flavour to it. I must admit I was a bit disappointed I wouldn’t have the opportunity to return to Jesse’s in the near future to feast on one of their chopping block entrees as the steak was seriously delicious!!! The owners have said that it is their aim to be known as the best steak restaurant in Alabama…..if our visit was anything to go by I would say that this dream will surely become a reality very very soon! 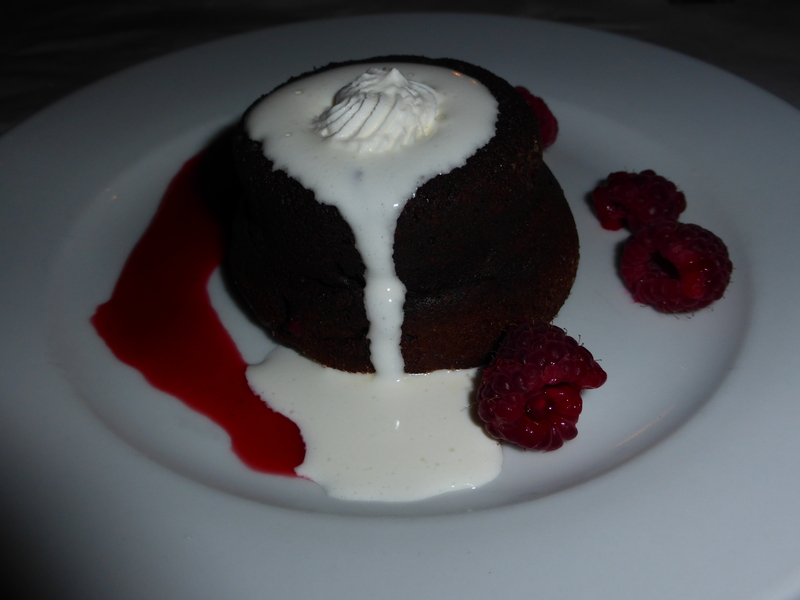 Although we were extremely full, Neil and I felt we really should squeeze in a dessert so we opted for the ‘Callebaut Chocolate Lava Cake – Gluten free, made with the best chocolate available, fresh raspberries, raspberry sauce’ to share. 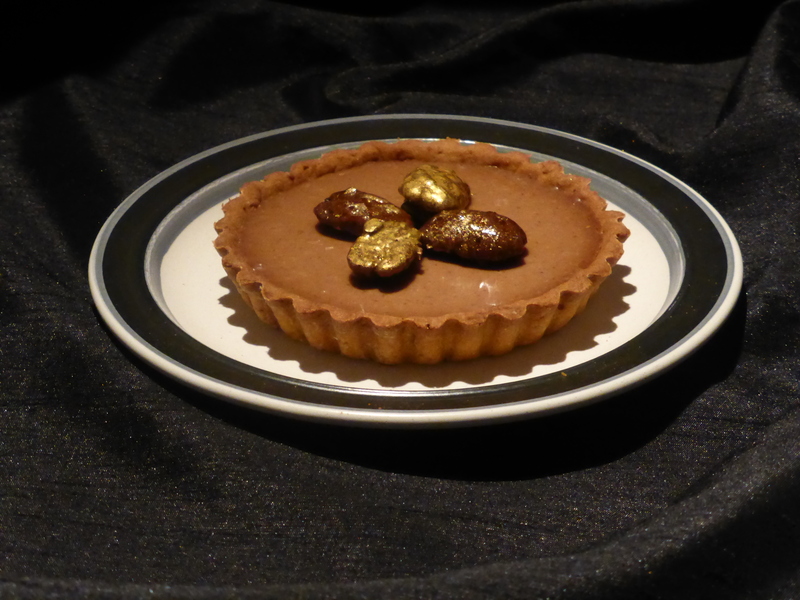 Lovely and chocolatey with the right amount of ‘ooze’ in the centre this was a decadent treat! 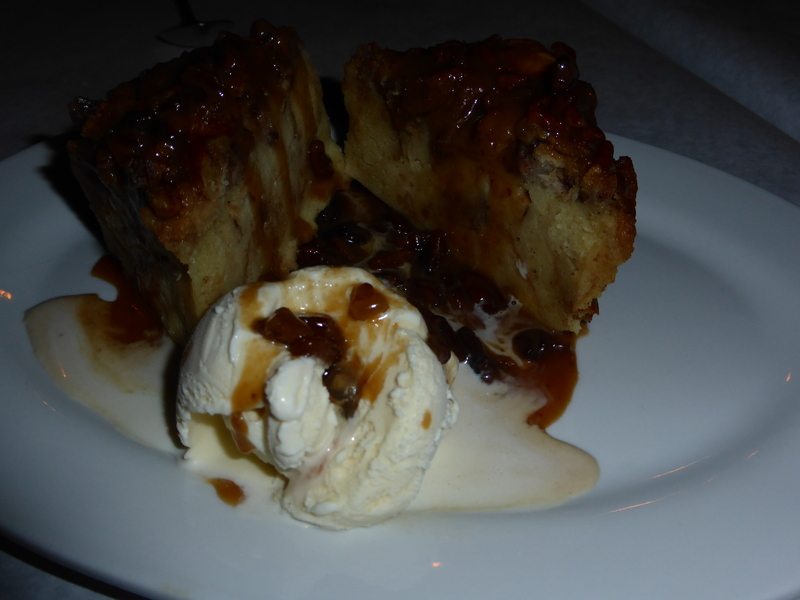 The owners also sent over a ‘Pecan Praline Bread Pudding – Warm praline sauce, Haagen Dazs ice cream’. Bread pudding is very popular in the Deep South and this version was amazing!! 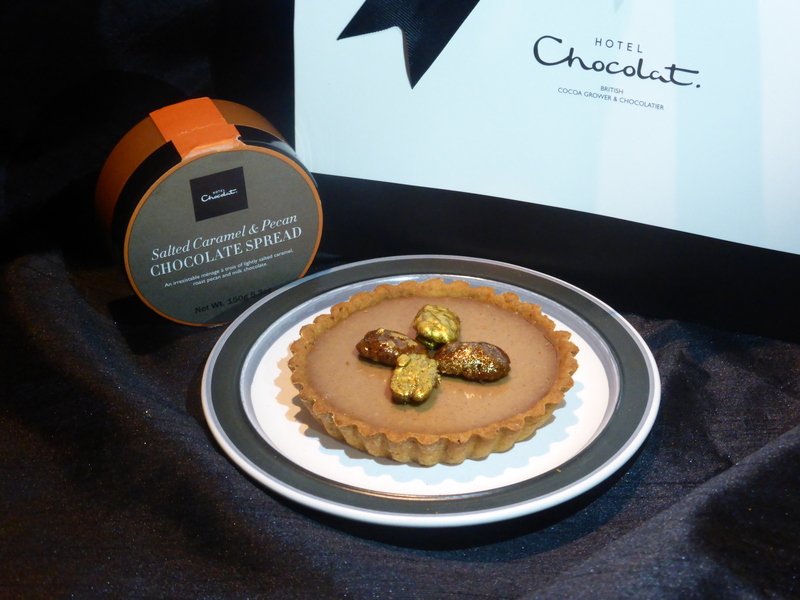 It was sweet, sticky, dense and nutty…the perfect way to finish the perfect meal! Our meal at Jesse’s restaurant was a lovely way to end our short stay in beautiful Fairhope, catching up with wonderful friends. It is a fantastic restaurant, full of charm and history – an absolute must visit if you are anywhere near! Despite staying true to its roots and retaining that wonderful Southern charm, Jessie’s respectfully dishes up numerous traditional Southern dishes with a modern twist in an elegant and stylish way, whilst sympathetically honouring the special kind of fusion which is seen in the modern-day cuisine of the deep South. I have been told that customers from all over the state drive for several hours to enjoy a meal at Jesse’s and I can certainly see why! I am only envious I live some 4,000 miles away and can’t treat myself to another meal here any time soon. Very highly recommended.